University of Notre Dame researchers Shahriar Mobashery and Mayland Chang and their collaborators in Spain have published research results this week that show how methicillin-resistant Staphylococcus aureus (MRSA) regulates the critical crosslinking of its cell wall in the face of beta-lactam antibiotics. Mobashery, Chang and Juan Hermoso at CSIC, the Spanish Research Council, document that an allosteric trigger by a fragment of the cell wall at a distance of 60 Ångstroms (6 nanometers) activates a set of conformational changes that culminates in the opening of the active site from a closed conformation, enabling catalysis for the physiological role of the enzyme. They also document that the new beta-lactam antibiotic ceftaroline, recently approved by the Food and Drug Administration, is able to bind to the allosteric domain and trigger the same allosteric opening of the active site. This subversion of the allosteric control allows another molecule of ceftaroline to access the active site, which inhibits the function of the enzyme, leading to cell death by MRSA. This mechanism of action for the antibiotic is unprecedented and offers important insights for design of future drugs to combat MRSA. MRSA has been a difficult hospital pathogen to control and has emerged in the broader community in the past several years, especially in such places as prisons, locker rooms and nurseries. In the United States alone, the disease infects about 100,000 people and claims the lives of nearly 20,000 people annually. The paper, titled “How allosteric control of Staphylococcus aureus penicillin binding protein 2a enables methicillin resistance and physiological function,” is available online. 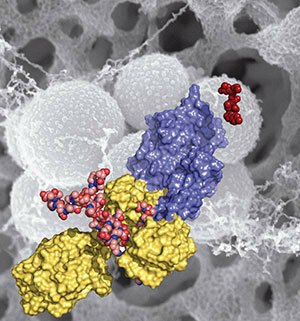 In the photo: Methicillin-resistant Staphylococcus aureus (MRSA) is shown in the background (in gray). This figure depicts domains and key ligands of the penicillin binding protein 2a — a key resistance enzyme. The red molecule on the right is ceftaroline, a drug recently approved by the FDA. Originally published by Marissa Gebhard at news.nd.edu on October 03, 2013.